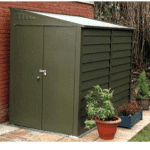 Steel Storage Sheds - Who Has the Best? Steel storage sheds are the best type of metal sheds you can invest in. Known for their incredible strength and zero maintenance benefits, there’s a wide choice available on the UK market. If you’re having trouble deciding which one best fits your needs, our top 20 steel storage sheds list can help. Whether you need something secure, large enough to store bulky heavy machinery, or whether style is your main concern; we’ve included something to suit everyone on this list. 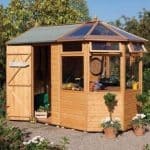 WhatShed is respected for its independent, in-depth reviews of garden buildings available in the UK. Therefore, we understand exactly what makes steel storage sheds stand out from the average. So what did we look for when choosing the steel storage sheds in this top 20 list? Well besides cost and quality, we also considered size, security and any distinguishing features that made a shed truly stand out. With such a large selection of steel storage sheds available in the UK, defining which one was the very best was no simple task. So we congratulate the Biohort Avantegarde Metal Shed which deservedly won the top spot on the list. No matter what type of garden building you’re searching for, WhatShed provides detailed, in-depth reviews that can really help you to make the best choice. In the steel storage sheds industry, Biohort is a firm leader, known for its range of superior quality models. This Avantgarde Metal Shed is no exception and is well deserved of the number one position on our top 20 steel storage sheds list. Why? Because not only does it offer an outstanding long-lasting design, but it also comes with some fairly unique, impressive features as standard. Firstly, the fact you can choose from three different colour finishes is a fantastic benefit. It comes in dark metallic grey, dark green or metallic silver; making it suitable for any garden. The fact it is also guaranteed for 20 years against rust is another excellent benefit. What’s really impressed us at WhatShed however, is that this model comes with a long list of unique, stand-out features. Take the acrylic glass fanlight for example. No other steel storage sheds on the list come with this unique feature. It also offers a fantastic 3-way security cylinder locking system. An integrated gas powered operating mechanism ensures once the doors are closed, they stay closed. Two integrated gutters and a substantial amount of tool storage and shelving included with the shed complete its exceptional value for money. You’re getting a lot more with this shed that you won’t get from any other model. That’s why we’ve chosen it as the best of the best steel storage sheds currently on the market. The Biohort model is hard to follow, but this Trimetals Titan 108 Metal Shed does a pretty good job! 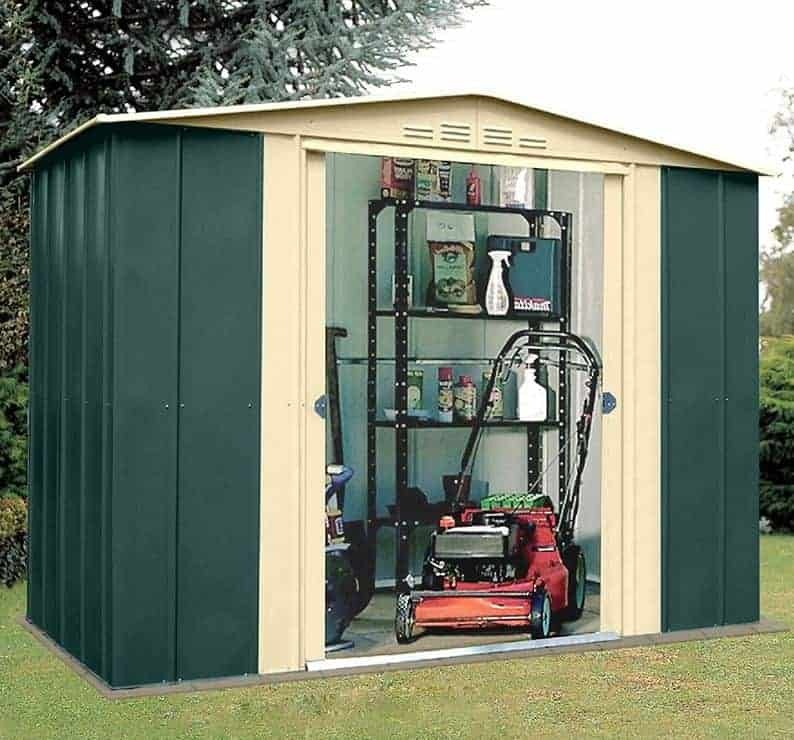 You’ll find there are a lot of different Trimetal steel storage sheds out there, but this is definitely one of the more noteworthy models. 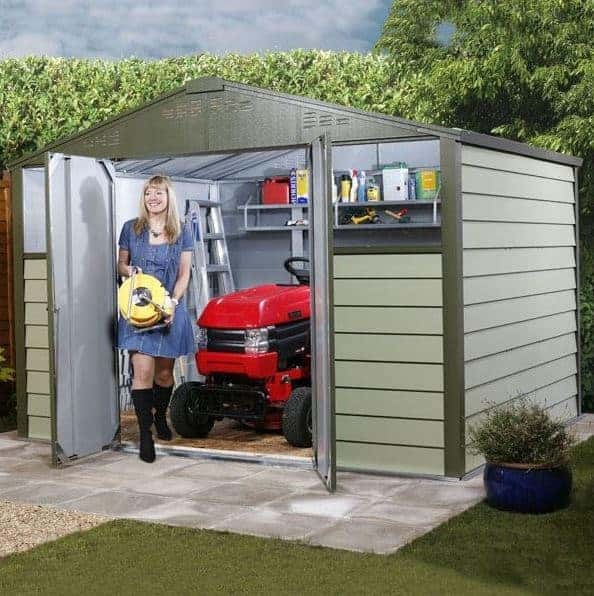 Offering plenty of space to store everything from mowers to garden tools and machinery, this spacious high quality shed has plenty of benefits. For starters, its strong steel construction gives it a 25-year warranty. This is one of the longest warranties available for steel storage sheds in the UK. Its security is also worth pointing out. The double doors are fitted with a cammed locking bar; a rare feature that you won’t find anywhere else. Another security feature is its integrated acrylic windows. These create a light, spacious feel whilst offering more security than standard shed windows. To increase airflow and reduce condensation, the manufacturer has also included clever integrated roof ventilation. You can tell just how popular this shed is by the number of merchants that sell it. Overall this is one of our favourite Trimetal steel storage sheds and it’s really guaranteed to last. 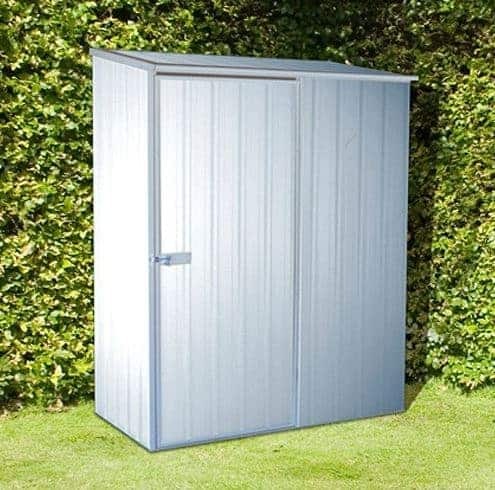 At number three we have the exceptional quality Billyoh Clifton 10’ Fronted Premium Hot Dipped Galvanized Metal Shed. Now what’s interesting about this high quality model is that not only is it one of the best metal storage sheds we could find, but it’s also one of the most affordable. Its low cost surprised us considering the excellent features it comes with. For example, not many metal storage sheds come with rear and front vents, allowing a huge level of air to circulate throughout the interior. It also gives you more space inside than the average metal storage shed. Style is something else this model has going for it. 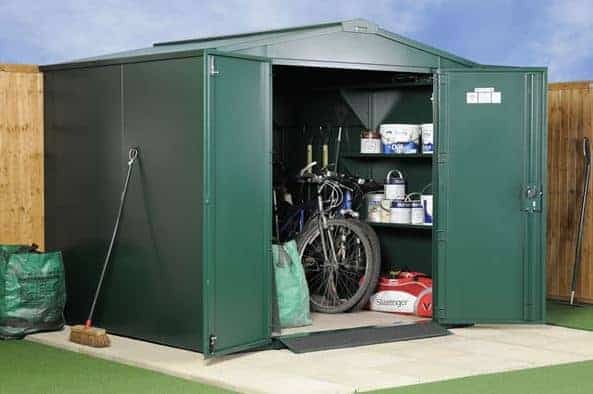 All Billyoh metal storage sheds are designed with a modern style in mind, but this one is particularly attractive compared to the majority of metal storage sheds out there. However, its ribbed panel design is there for more than just style purposes. It also makes the walls extra-tough too. The building as a whole is very secure and the doors can also be padlocked to keep your storage safe all year round. 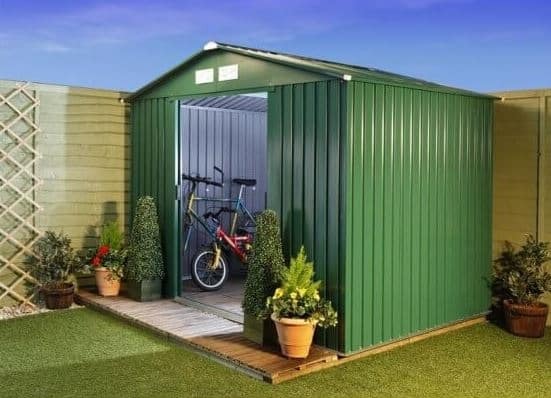 If you’re looking for metal storage sheds that are guaranteed to last for many years, offer a stylish look and give you a large level of interior space then this is one to consider. 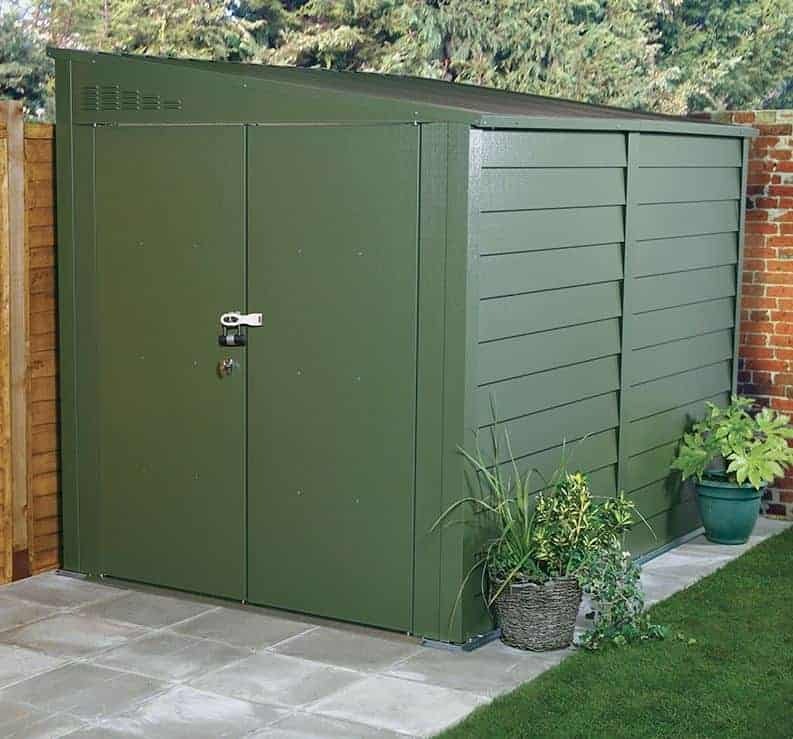 One of the strongest designed steel storage sheds on the list, the Asgard Gladiator Secure Metal Shed is available exclusively from Taylors Garden Buildings. What’s unique about this model is that it can be totally customised to fit your needs. 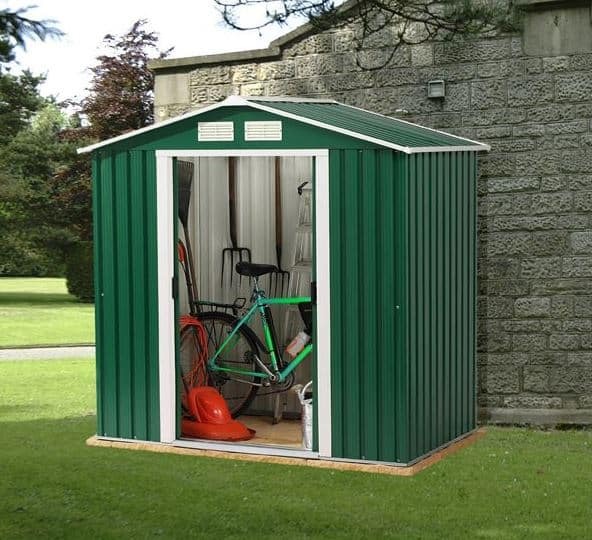 It is advertised as also being one of the best sheds for valuable storage due to its exceptional security features. 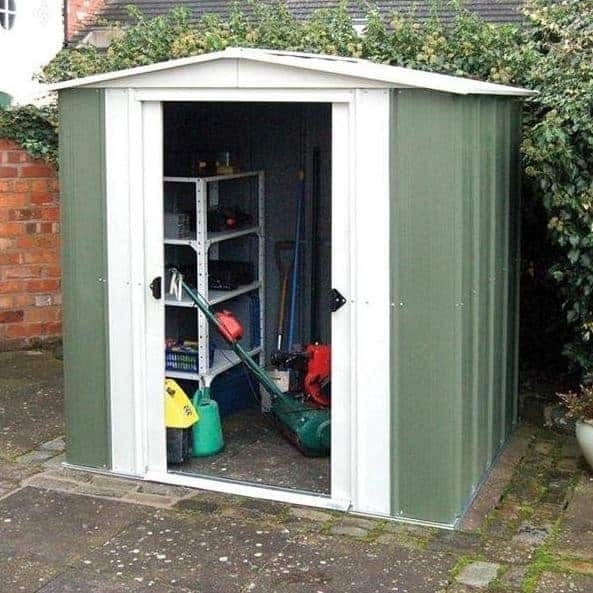 This is also one of the few steel storage sheds that features a floor, though it is still recommended you build it on top of a solid, even surface. So let’s talk about what really sets this shed apart. Firstly, it is constructed from 1.2mm thick galvanised steel. This is actually a lot thicker than average steel storage sheds. However, most impressively is the 1.6mm thick steel boxed sections around the door. This really boosts its security and is resistant to forced entry. The lock featured on the doors is also protected by steel housing measuring 1.6mm thick. It is a drill and pick resistant cylinder lock and there’s also a double bolted trap side. This is just a few of its security features. Out of all of the steel storage sheds we’ve reviewed and compared, this one is yet to be beaten in terms of strength and security. So if you have a lot of expensive equipment, machinery and tools, this model is definitely the one you need. It also comes in a choice of colours and as mentioned it offers a long list of customisation options. These include shelving and hooks, extension modules and extension flooring. Trimetals is a definite leader in the steel storage sheds industry when it comes to quality and affordability. This great Titan 960 pent shed is a brilliant example. We’ve already highlighted one of the Apex models earlier, but this pent variation is excellent for those with height restricted gardens or for those who simply prefer pent design buildings. For your money you receive a fantastic 25-year guarantee. It is both galvanised and PVC coated and it is rated Class 0 & 1 fire resistant. So whether it is faced with harsh storms, heavy downpours or if there’s an unexpected wildfire (or arson attack), you can be sure your storage is going to remain completely unaffected. It’s also nice to see that it features excellent security. A lot of steel storage sheds come with pad-lockable doors. This one however features a lock and key mechanism. So your storage is safe from both nature and potential thieves. Its windowless design means everything stored inside is kept private and inside the shed you are faced with a generous amount of storage space. All in all, it’s a great shed that would look particularly good installed next to a fence or even your home. 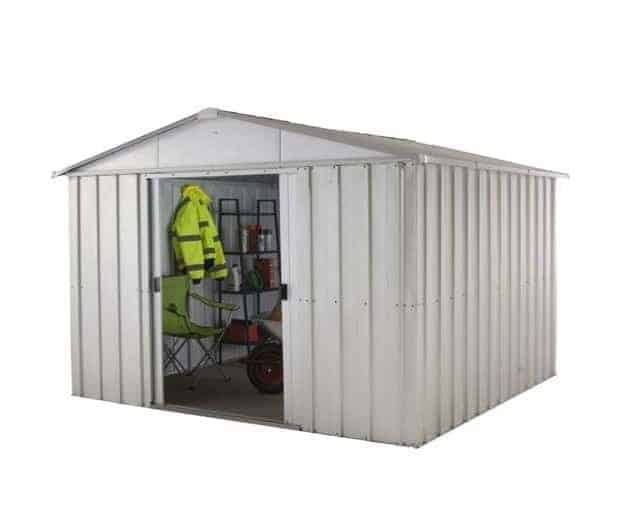 The third Trimetals Titan shed to be feature on our top 20 steel storage sheds list, the 680 metal shed is also supplied with a 25-year guarantee. It’s actually very similar to the Titan 108, only this model comes at a more affordable price tag and a slightly smaller size. It’s the best choice for the average homeowner looking to buy a strong, secure, superb quality shed. It’s actually the security that has made this stand out to us. Complete with a key operated lock, the shed also features a cammed locking bar for additional security. This is something that is largely only found with Trimetals sheds. It’s certainly not something we’ve come across on other steel storage sheds at this price level. Its singe door also comes without windows to boost its security and privacy. Fire resistant and benefitting from superior weatherproof benefits, the shed also offers reassurance even in harsh British weather. The manufacturer has added an intelligent vent system built into the roof which far surpasses that of most steel storage sheds on the market. So it’s the security and intelligent, premium features included with this building that help to set it apart from the crowd. 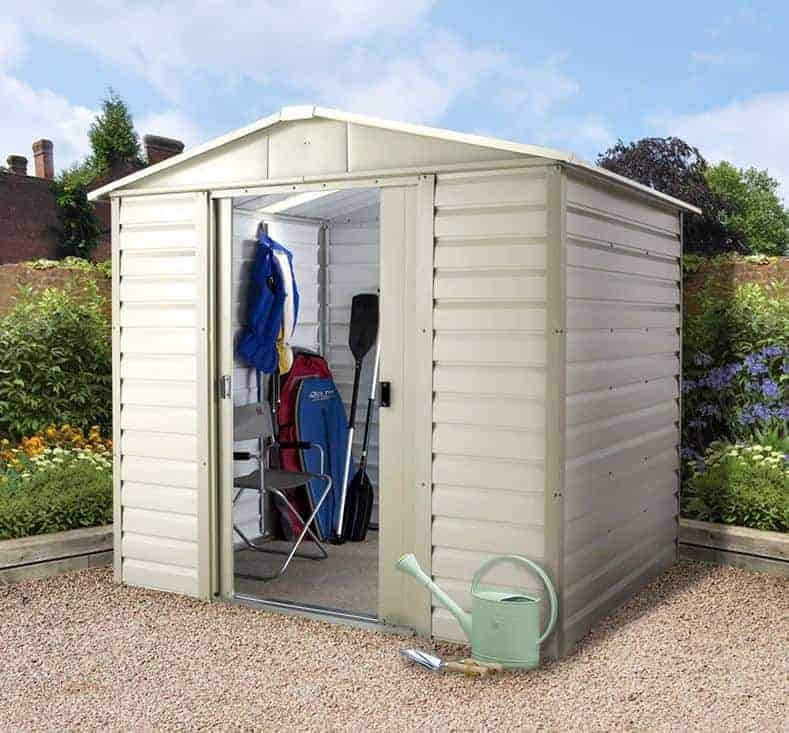 Built by top manufacturer Rowlinson, the Woodvale 8×6 Apex Metal Shed is a stylish addition to any garden. 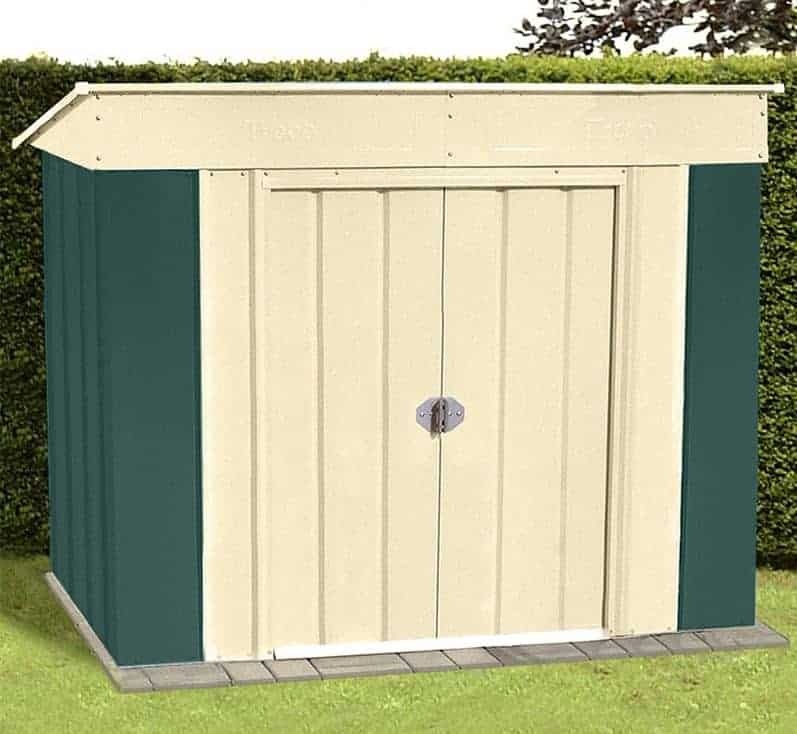 With an eye catching two-tone design, this great sturdy shed provides a wooden look, whilst offering all of the great benefits of steel storage sheds. Its galvanised steel construction ensures you receive a 10-year guarantee, giving you reassurance you’re getting great value for money. Its main selling point is its lockable double sliding doors. This sliding feature is unique to metal models, though not all steel storage sheds come with them. They don’t just make it easier to transport storage in and out of the building, but they also offer excellent space-saving benefits too. They also ensure you have maximum space to enter and exit the shed, sliding all the way to either end. When we took into account its style, tall height, unique wood like appearance and excellent low cost, we couldn’t not include this model on our top 20 steel storage sheds list. If you’re looking for more compact steel storage sheds, this little 6×8 Store More Emerald Parkdale Apex Metal Shed is perfect. Not everyone has the luxury of a large, spacious garden and the choice of smaller steel storage sheds is somewhat limited. This model is brought to you by one of the most recognised names in the industry. It has been built to last and is sold with a 10-year warranty. 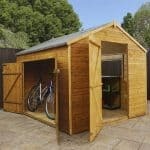 As it is one of the smaller sheds to be featured on the list, it’s also incredibly simple to install. It comes with all of the benefits you’d expect from great quality steel storage sheds such as ventilated gables, a high tensile steel construction and sliding doors. It also comes with features you wouldn’t expect to find on a shed of this price range such as pad-lockable doors and a taller than average height. It’s a simple shed with impressive durability and one of the best value steel storage sheds you’ll come across. 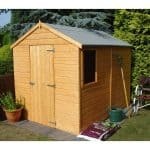 There are a range of Shed Baron sheds to choose from and this Grandale model is one of the most popular. This is largely down to its extremely low price and the range of great features that come with it. 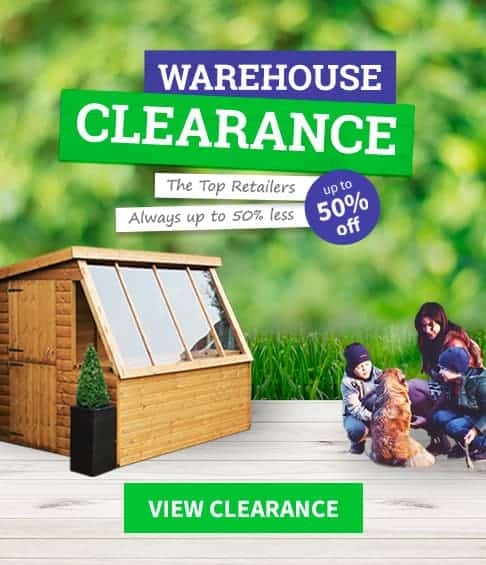 It is one of the longest lasting sheds on the market, offering not just a weather resistant design, but also a rodent and insect proof design too. Absolutely nothing is going to damage this shed and with its crack and fade resistant design, it’s guaranteed to look like new for years. If you want to make this shed truly unique, you can opt to have a timber floor installed. If you’ve spent any time looking at steel storage sheds, you’ll know not many of them come with a floor included. What’s the benefit of adding a floor? Well it makes the shed more stable and more comfortable to use in the winter months. 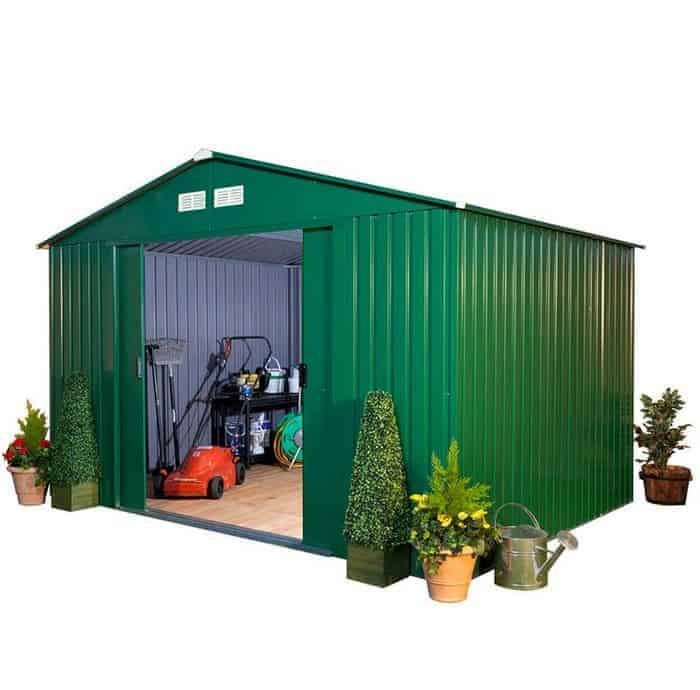 This is one of the best all-round impressive steel storage sheds you can buy and at such a low cost it’s a fantastic investment. If price, convenience and longevity are your main concerns, this Yardmaster 86SL Shiplap Metal Shed is the right choice. Fully galvanised and painted inside and out, this attractive shed comes with high quality Shiplap style cladding. There are actually a few reasons we chose to add this model. Firstly, its wood-like appearance is unique. If you’re a fan of Shiplap wooden sheds but you want the maintenance free and durable benefits of steel, then this is the perfect solution. Secondly it has one of the tallest designs with its eaves measuring 6’. So if you have a lot of taller equipment or if you’re taller than average and looking for steel storage sheds that are going to be comfortable for you to walk around in, this is the shed you need. If security is important in your area, the internally fitted sliding doors will prove to be a massive benefit. They are a lot more difficult to break into and the addition of drilled holes allows you to attach a padlock to keep the shed protected against potential thieves. 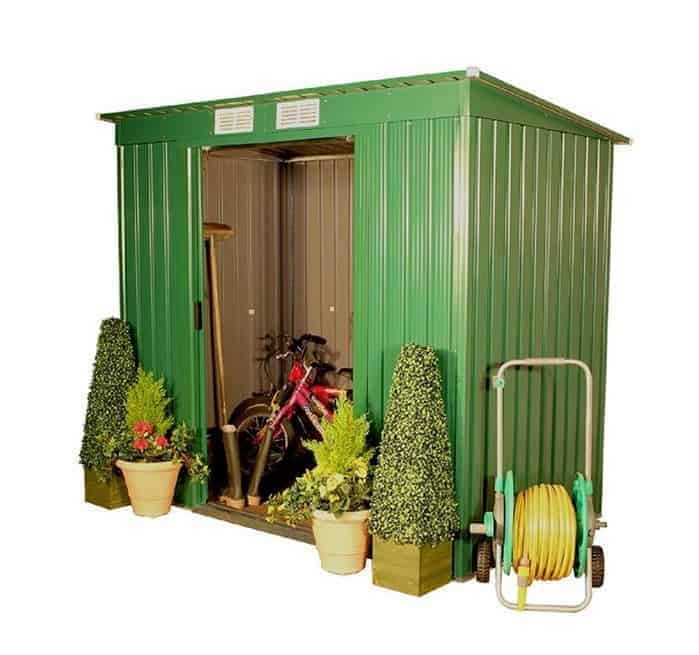 This 6×5 Shed Baron Grandale Low Pent Metal Shed is great for gardens with serious height restrictions. All pent sheds are designed to be installed against and in front of buildings or underneath low hanging objects. However, surprisingly they still often come with a pretty tall design. If you need something lower than the average steel storage sheds available on the market, this model is exactly what you’re looking for. The manufacturer has given this shed a unique, eye catching two-tone colouration. Contrasting cream and green make sure this shed really stands out. It isn’t just painted on the outside either. It benefits from an inside paint job to ensure it looks fantastic both inside and out. Its entire construction is hot dipped galvanised steel and for peace of mind you get a brilliant 20-year warranty. So it’s not just an attractive, space saving shed, it’s also a very affordable one! As its great convenient sliding doors can also be padlocked, you’ll also benefit from fantastic security. Out of all of the compact steel storage sheds out there, this is the very best available. Its small size means it will fit into any garden, large or small. A lot of the Billyoh steel storage sheds look the same due to their green painted finish. However, this Beeston model boasts something a little different. It comes with great grooved panels which don’t just make it stand out from other models, but they also provide extra protection. 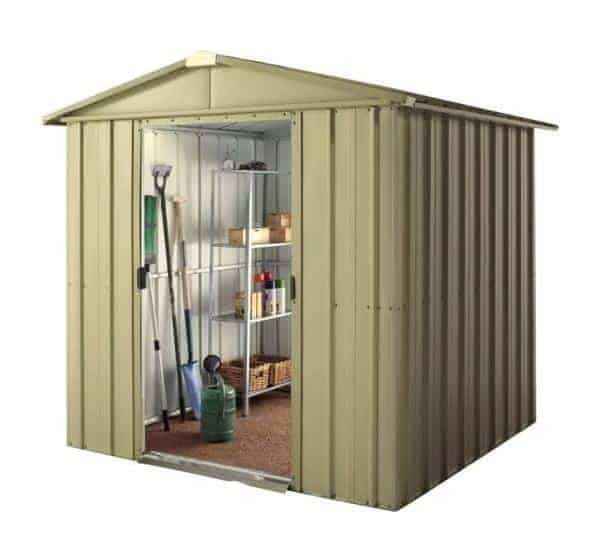 Constructed from one of the leading manufacturers in the steel storage sheds industry, you’ll also find this shed offers a much better quality than most. Compared to its competitors, the Beeston 8’ fronted model also benefits from more internal space. So it’s both more practical and comfortable compared to most steel storage sheds of the same size. It also offers a very comfortable head and wall height. In fact, its walls measure 165cm from floor to roof. Coated with a zinc layer, it’s also guaranteed to last the test of time. Front and rear ventilated gables, very large double doors and a superb 15-year guarantee all make this shed a very worthwhile purchase. We didn’t think it was possible for steel storage sheds to look as elegant as this Yardmaster Glencoe model. With its gorgeous deep brown two-tone colouration, this exquisite building is going to enhance the look of any garden. Benefitting from stylish, thick Shiplap style cladding, it offers a wooden effect whilst providing the exceptional zero maintenance, strong benefits of galvanised steel. The convenient sliding doors are padlock compatible, so you can add strong security if you need to. It also benefits from taller than average height making it another great model for those seeking extra headroom. The thing that really drew our attention to this shed as well as its elegant design, was the fact it comes with a free anchor kit. This extra isn’t something you typically get with steel storage sheds and it helps to ensure wherever you install it, the shed stays put. All of its parts benefit from a 10-year warranty and are fully rust-proof designed. Easy installation also means you’ll have this shed up and ready to be used in no time. Add to this its super-low price and you have one of the best steel storage sheds on the market. 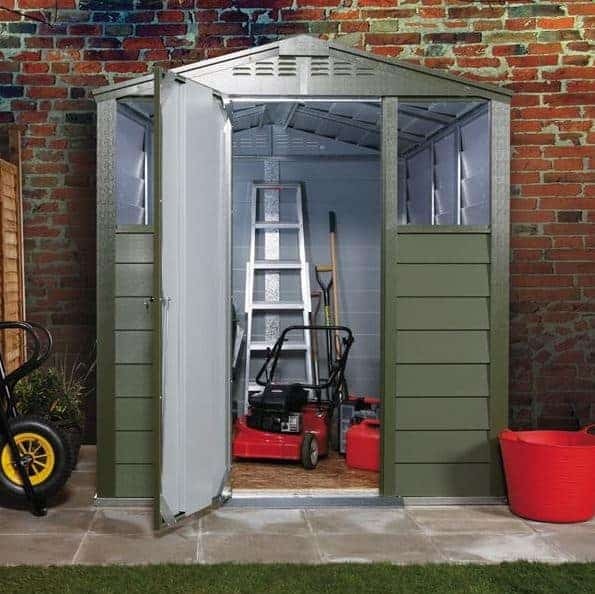 The Hampton Deluxe Apex Metal Shed and Support Frame is sold exclusively at Homebase. It is one of the few steel storage sheds to focus on both quality and lighting. Steel sheds are typically designed with privacy in mind which means they are sold without windows. This can cause issues with lighting, making it difficult to see what you’re doing. The manufacturer has addressed this issue by adding two large translucent panels into the shed’s roof. So you’re left with a naturally light interior, whilst still benefitting from excellent privacy. It’s also one of the few steel storage sheds within this price bracket to feature a 12-year guarantee and a free anchor kit. It’s these exclusive features that helped to earn this shed a spot on our top 20 steel storage sheds list. The anchor kit is especially useful as it ensures the shed stays exactly where it is no matter how stormy the UK weather becomes. We also like its overall style with a light green painted finish. If you’re looking for a stylish, high quality shed that won’t break the bank, this is a brilliant choice. 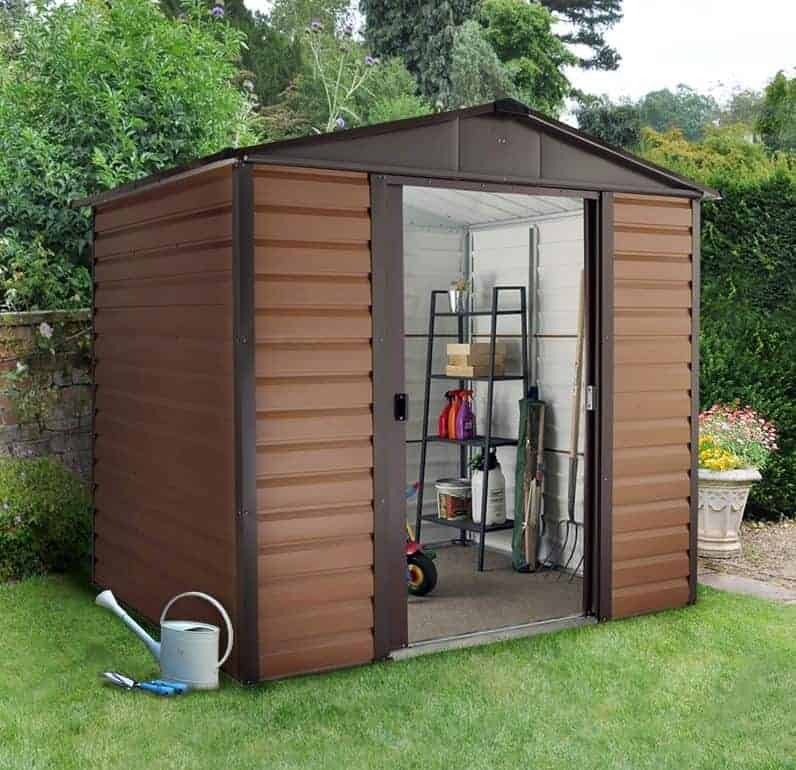 Rowlinson have some pretty awesome models to choose from, but this simple metal apex shed is great for those looking for a no frills storage space. Whilst it does offer a very simplistic budget-friendly design, it is built from incredibly tough steel. Offering a rot and fire resistant design, you can be sure this is going to really last no matter what gets thrown at it. Its size is another reason we added it to the list. You’ll notice we’ve largely included 8×6 models because they tend to be the most popular. However, this 10×8 model is great for those with a large garden who have a lot of storage requirements. You can store anything in here from large garden furniture to a ride on lawnmower! Like most steel storage sheds it doesn’t come with a floor so it’s excellent for heavyweight storage. Double locking compatible doors and a green and white painted finish also help to add value to this low cost shed. All in all, it’s simple, large, convenient and long-lasting. So if no frills is what you are going for, this is the shed for you. Now onto something a little different. 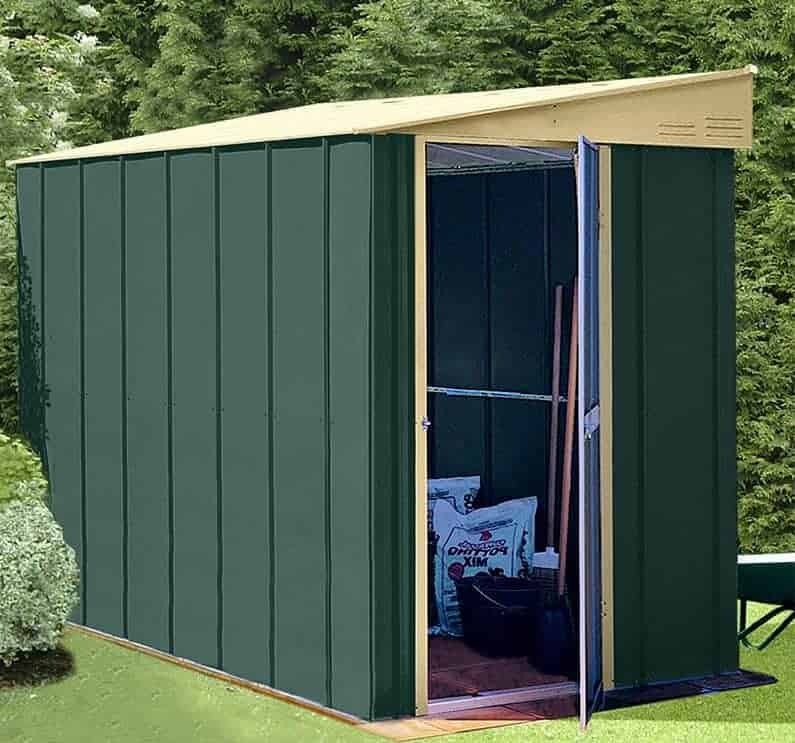 This lean to metal shed from the popular Shed Baron Grandale range is perfect for those with very limited space. Capable of fitting into a narrow section of the garden, its lean to design lets you install it right up against another building or fence. It is especially well-suited to those with very minimum storage needs. Painted on the outside and inside, its high quality finish ensures it looks super-stylish in the garden. You’ll find very few lean to steel storage sheds on the market but this superior model is the best available. What stands out with this shed, despite its unique lean to design, is the customisation options on offer. It comes with shelf, flooring and window options, helping you create a model that fully suits your needs. Very few steel storage sheds give you this level of customisation. A 20-year rust perforation guarantee highlights just how strong and durable this shed really is. So if you want your money to go further and you need something that won’t take up much space, this Shed Baron model is the one we’d recommend. When you think steel storage sheds, budget isn’t something that usually comes to mind. However, this great Lotus Apex Metal Shed proves steel doesn’t have to be expensive! It also proves that even if you’re working with a tight budget, you can still benefit from some pretty impressive features. 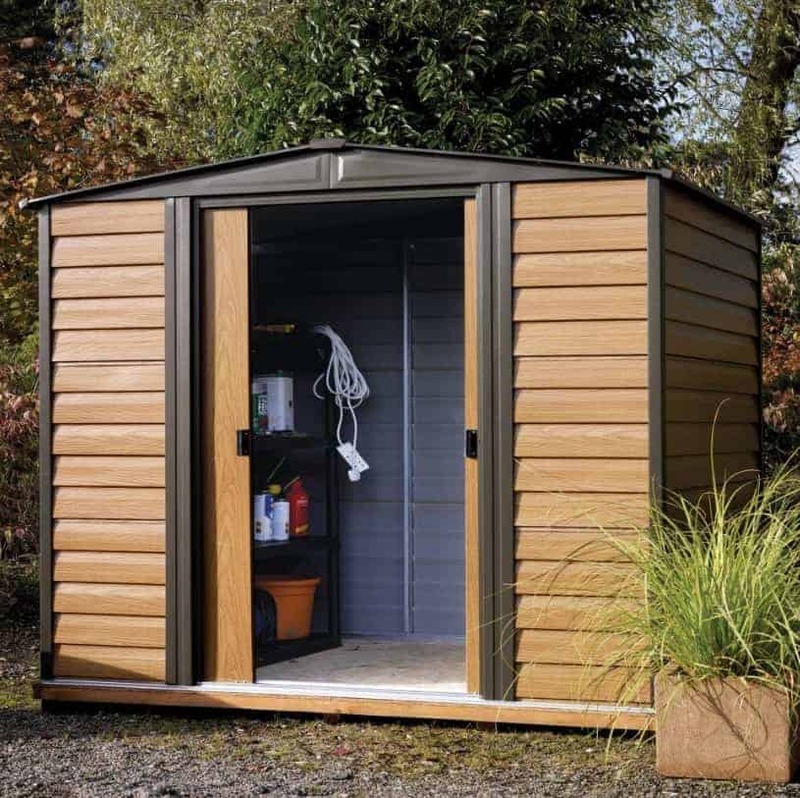 A 10-year warranty, sliding lockable double doors, integrated ventilation and simple assembly are all supplied as standard with this stylish, durable shed. Made from high tensile steel, the shed also benefits from a great lightweight design. This benefits you in a number of ways, with the main one being its easy installation benefits. Not only will you find it easier to fit the panels together, but you’ll also find it quicker than average steel storage sheds too. Its lightweight feel doesn’t reflect its quality however – it’s a deceptively strong and long lasting building. Requiring zero-maintenance, this is a super-affordable option for the budget conscious. 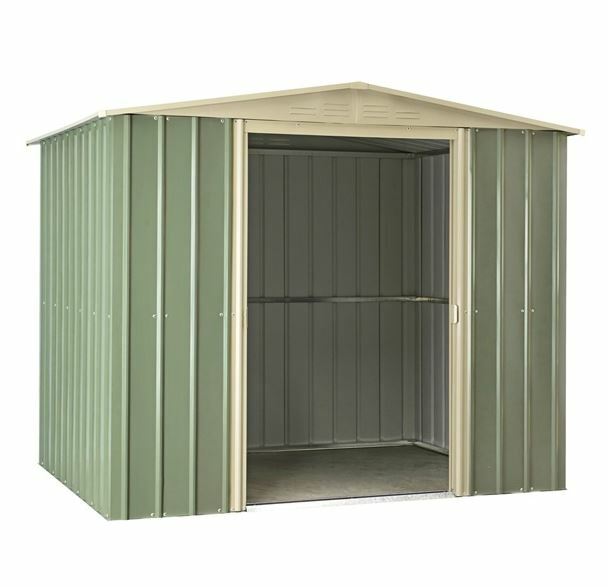 One for those who have limited storage requirements, this easy build Premium Titanium metal shed is a tough little storage solution. 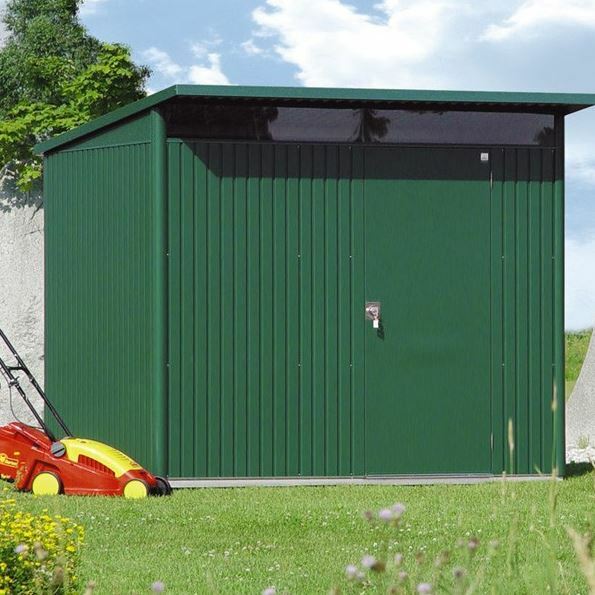 Most steel storage sheds come in a large size more suitable for medium to large gardens. This one is great for the smaller garden and its Snaptite assembly is one of its biggest advantages. It basically means when it comes to installing the shed, the panels will simply slot together with ease. This doesn’t just eliminate the hassle of installing steel storage sheds, it also really speeds up the process, ensuring you can use your new shed in no time. Don’t let its compact size fool you; this is a very strong, weather and fire resistant building. 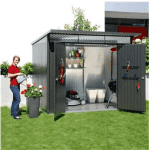 It offers plenty of space to store a variety of gardening equipment and tools and its pent design makes it great for installing against or in front of fences, walls and buildings. Most impressively, it’s even guaranteed to withstand high wind speeds. This is definitely something we didn’t expect to find on a shed at this price level. Its titanium finish makes it one of the best looking steel storage sheds out there too. So in terms of what you get for the money you spend, this one beats all of its competitors hands down. The final Billyoh model to make it onto the list is this highly affordable, premium quality Sutton Pent Roof Metal Shed. You’d think we’d have covered all of the unique features steel storage sheds could possibly come with by now but this great little shed offers something no other shed on the list does – a corrugated roof. This roof design offers significant weatherproof protection. In fact, it largely contributes to the fantastic 15-year warranty supplied with the shed. 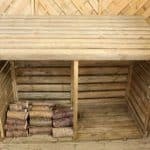 This is a great option for those looking to declutter the garden and is small enough to fit into any available space. The range of features included with this pent shed are spectacular. An entry/exit ramp, generously sized double doors, dual ventilated front gables and a hot dipped galvanised construction all come as standard with this brilliant model. What’s more, it has a stylish look too so it’s bound to look great in the garden. There are also a few additional extras available that can help you get the most from this shed if you’re willing to spend a little more. The league table wouldn’t be complete without this great Yardmaster 10ftx13ft model. With wide, ribbed panel construction, this large shed is constructed with 100% galvanized steel. A stylish silver finish gives this a stylish look, ensuring it fits in with modern garden décor. It is the most affordable and best quality model out of all of the steel storage sheds of this size. We largely recommend it to those with heavy, large storage. Sliding doors open up to reveal a very generous entry space, enabling you to get all kinds of furniture and equipment in and out with ease. These doors can also be padlocked for security. Yardmaster is one of the most well-known manufacturers of steel storage sheds and this is one of its most affordable models. So if budget is an issue but you really need a large shed, look no further than this model with its great 10-year guarantee.